The aim is that by the end of this five-step process, your goals (combined with your MyBudget budget) will represent a money map for the year ahead and beyond. What does your ideal life look like? Visualise where you’d like your money to take you and start jotting down some ideas. Does it include being debt-free? Perhaps there are places you’d like to visit, concerts you’d like to attend, sports or hobbies you’d like to try. You might see yourself driving a new car or a boat or renovating your home. Your dream could be to send your kids to a different school or take them on a holiday. Think big and small. Your goals do not have to be long-term or complicated to be worthwhile. In fact, it’s important to have a mix of goals. This is your life and your financial goals are yours for the choosing! As you review your list, you'll probably notice that some goals are going to take more effort and time than others. In goal setting language, those goals that are the hardest to achieve are called "stretch targets." Stretch targets can be great for changing unwanted behaviours or breaking out of negative thought patterns, but having too many of them in your goal list can be demotivating. It’s better to have goals that are realistic and achievable. Goals need to be specific and actionable. For example, if your goal is to be debt-free, specify exactly which debts you’re going to reduce this year and by how much. If your goal is to have savings, specify how much you’re going to save and how often. Avoid goals that rely on factors outside of your control (eg. winning the lottery). Focus only on outcomes you can directly influence by your own actions. For example, if your goal is to find a higher paying job, focus on the behaviours required to get the job you desire. You could rewrite your resume, send it to 20 top companies and follow-up with phone calls. Ask yourself: What goals can I start working towards immediately and what goals will have to wait? It would be nice to be able to achieve all of your goals simultaneously, but life isn’t like that. The reality is that you have to attack your goals in order of priority. Big goals are great, but smaller goals are easier to measure and keep on track — and you get to celebrate achieving milestones more often! For example, if your goal this year is to save a $1,500 for a new fridge, break it into 12 monthly saving goals of $125. What is a SMART goal? A SMART goal is one that is specific, measurable, attainable, relevant and time-bound. The idea behind a SMART goal is that it should capture the behaviours and actions that will lead to the outcome you desire. General goal: To have savings in the bank. SMART goal: I am saving $100 from each pay for my emergency fund. By the end of this year, I will have $2,400 in my emergency sub account. General goal: To cut back my social spending after the New Year. SMART goal: For January and February: I am taking my lunch to work three days a week; budgeting $80 a week for going out which I will pay myself in cash every Friday; going to after-work drinks only once a month; taking my credit card out of my wallet and using only cash. SMART goal: I am saving $100 per pay into my ‘holiday’ sub account so that I have $5,000 for my Bali trip in [month and date]: This year’s goal: $600 by April; $1,200 by July; $1,800 by October; $2,400 by Dec 31. How many goals do you need? The number of goals you set yourself is up to you. Some people will only write down their big goals, others will prefer to write down every little goal that comes to mind. Either approach is great. The most important thing is to not let the goal setting process become overwhelming or so difficult that you give up. 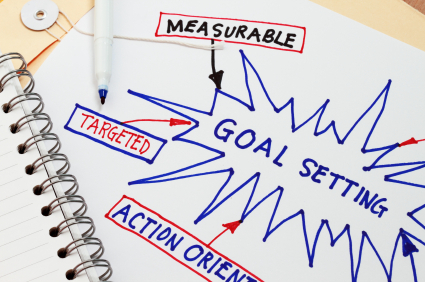 If you’ve been discouraged about goal setting in the past, keep it really simple this time. Pick just one small goal to start with — perhaps taking your lunch to work for a week. Remember that financial fitness is just like physical fitness - if your aim were to run a marathon, your first training sessions would be over shorter, more manageable distances. The same principle applies to your money - little, regular steps will quickly add up. Review your goals regularly. Are you on track? Do you need to tweak your plan? Are you progressing faster than you expected? Are there obstacles you didn't plan for? It’s okay to make adjustments. Your plan needs to be flexible to accommodate life’s changes. You might get a pay rise that boosts your budget and shortens your timeframes. On the other hand, your car might need costly repairs that eat into your savings. The great thing about goal setting is that plans may change, but you still have a clear target to aim for. As you're setting your goals and milestones, give some thought to how you will reward yourself along the way. You deserve to feel happy, motivated and excited about your achievements. Make room in your budget for an affordable celebration every time you achieve a milestone. Having a goals list will help you to resist distractions and overcome obstacles. It will also help you to stay focused if you think about your goals often. Keep your goals list somewhere you can read them once a day. MyBudget clients are welcome to speak with MyBudget's customer service team at any time about their financial goals. Readers who are not MyBudget clients are welcome to attend a free budget consultation. We're always here to help.